The Avenue of Stars is located in Hong Kong, and is very similar to Hollywood’s Walk of Fame. It is situated along the waterfront area of Victoria Harbor in the Tsim Sha Tsui area. It honors Hong Kong’s past and present film celebrities. The avenue is very popular with tourists and locals. In 2003, the New World Group announced that it was going to build the Avenue of Stars which would cost nearly $40 million Hong Kong dollars. The avenue opened to the public in April, 2004. Hong Kong’s Tourism Board states it was created to acknowledge the movie industry’s contributions for promoting the famous city as a worldwide destination. In the beginning, one hundred actors, both dead and living were honored. Hong Kong’s local film board stated that they plan to add more stars. This attraction is a bit different than the Walk of Fame in Hollywood. 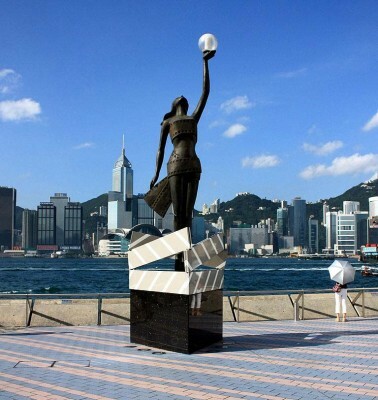 The avenue not only features plaques that have the names of Hong Kong’s most famous actresses and actors, but also features a video about the Hong Kong’s movie industry, beautiful sculptures of various notable celebrities and many souvenir kiosks. Many names included are only recognized by fans of Hong Kong films or the local community. Others names are well-known by fans around the world such as Sammo Hung and Jet Li. One popular addition to the avenue is a two meter high Bruce Lee sculpture that is made with bronze. In 2005, it was dedicated to honor his birth in 1940. This attraction is free to the public and can be seen any time during the day or night. It is illuminated in the evening with numerous twinkling lights and many consider this to be the best time to visit the area. Tsim Sha Tsui’s promenade offers a sensational view of the beautiful harbor and is an ideal place to watch the Symphony of Lights, which many say should not be missed when visiting Hong Kong.